Doilies are essentially webs. They are woven circular repeating patterns and they kind of look like dream catchers dontcha think? I do, apparently so do others. 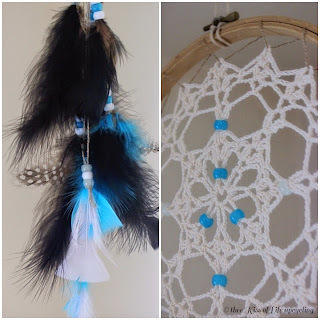 I saw this, a while back, a Tutorial for a Doily Dream Catcher at Etsy.com and it is a good one. The doily chosen for the projects main display photo is a lacy looking doily adorning a macrame hoop. I don't have any macrame hoops though so I had to use something else because I totally wanted to make this. An embroidery hoop does the trick! There's a handful of tutorials for this. They are all awesome. It's pretty neat to see an old doily transform like that. You want to take your doily place it in the center of the inner hoop and just work the yarn or rope or string whatever you're using and pick holes in the doily that will pull the doily equally on all sides. Then you place the other hoop and screw it in place. Now adorn by hanging feathers with beads. I had to split some beads to make them go over the doily since you can't string them through an already made doily. I would have much liked all white feathers but I only had two and I work with what I have. 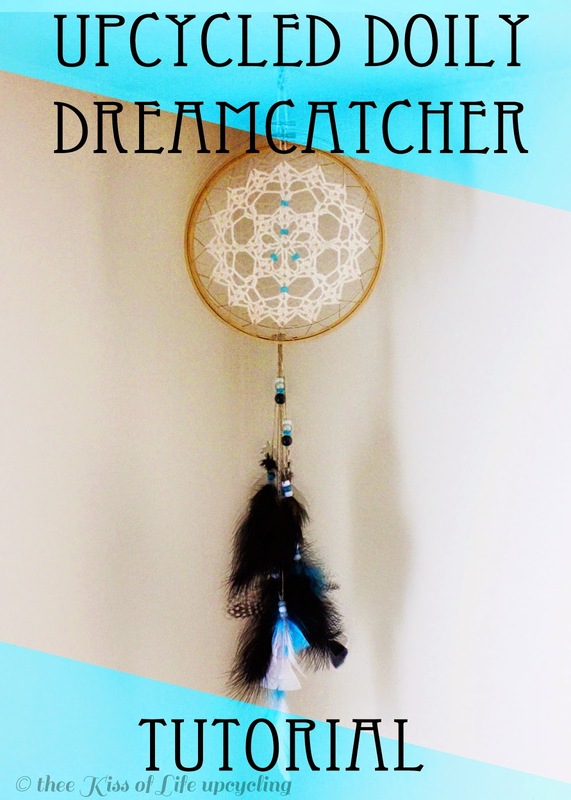 I have many embroidery hoops and I think in order to make the dream catcher look more "authentic" it's good to chose a bigger hoop than your doily so you can weave it into place. I wanted to weave the yarn all the way around the hoop but I didn't have enough. 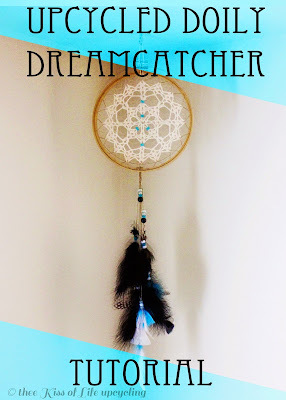 You can decorate your dream catcher with whatever you like! These beads glow in the dark.